These 3D board books with press out figures fold out to make special play scenes. They are based on Psalms 23 and 65. 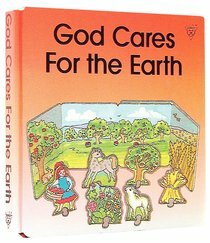 About "God Cares For the Earth (Concertina Board Books Series)"
A concertina book with push-out characters that make animal play scenes with relevant backdrops. The text is closely based on Psalm 65, but is retold at a very simple level, focussing on images that should be meaningful to a young child. This 3-D board book is based on the 65th Psalm in the Bible, and young children can press out the figures to create their own play scene against the background of the other side of the book.